﻿It’s easy to overlook the needs of Young Carers since support is often focused on the family member needing care due to an illness, disability, mental health or addiction issue, or language barrier. 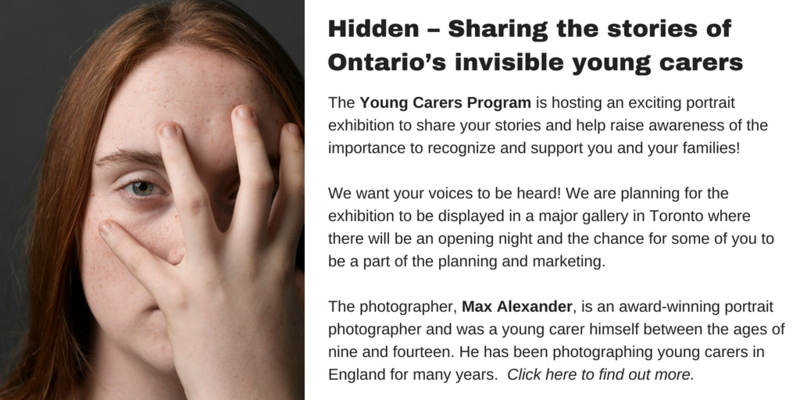 Caregiving can build great strengths, but it can also be very hard and may make a child or youth feel different and alone, but Young Carers exist worldwide and they are supported in Toronto! Young carers are kids under the age of 18, who are in a caregiving role for a parent, grandparent, sibling or relative with a chronic or life threatening illness, disability, addiction, mental illness, or language barrier. YCP aims to provide therapeutic programming to help kids with adult responsibilities cope and interact with other kids who know exactly what they are going through. At the time this video was taken, Samiha was only 15 and cared for her mother with ALS. Help kids be kids by giving as much or as little as you can from $25, $50, or $75. ​Let us know if you are interested in volunteering your time. Together, we can provide an instrumental program to some pretty amazing kids. The Young Carers Program was selected as a 2016 Vital Youth/ Playing for Keeps Grant Recipient. This award has been provided through the Vital Toronto Fund at the Toronto Foundation. Financial support from CIBC, Mackenzie Investment Charitable Foundation, Ontario Trillium Foundation and TD Securities Underwriting Hope Charity Auction.